An engagement ring has to last a lifetime, so choosing the right style and colour is one of the most important choices you have to make — after deciding on the right person to marry, of course. Diamonds are still the most popular, but coloured stones are increasingly becoming the choice for fashion-conscious brides-to-be. Follow in the footsteps of stars such as model Elizabeth Hurley, who received a sapphire engagement ring, and actress Halle Berry, who was given an emerald and diamond creation. Then there is the singer Jessica Simpson, who received a five-carat ruby ring in honour of her July birthday and, of course, Kate Middleton. Prince William presented his then bride-to-be with the sapphire and diamond ring that once belonged to his mother, the late Diana, Princess of Wales. Coloured stones can look fantastic alongside a plain gold wedding band but there are still some important decisions to make. Diamonds are popular for one very good reason: they are the hardest gemstone, and you will have to make sure your ring is durable enough. Of course, coloured diamonds may be the perfect answer. They are available in every shade of the rainbow, from blue and pink to yellow. You can even get rare green and red varieties if you have the finances to pay for them. Sapphire and ruby are the next hardest gems, so they also make a good choice for one of the most romantic pieces of jewellery you will ever buy. There are also the semi-precious stones to consider, such as garnet and rubellite. Think about what colours suit you, what clothes you usually wear and what you want your ring to say about you before you settle on your final choice. Also consider sentimental factors such as what your mother’s or grandmother’s engagement ring was made from, or the birthstone of someone close to you. 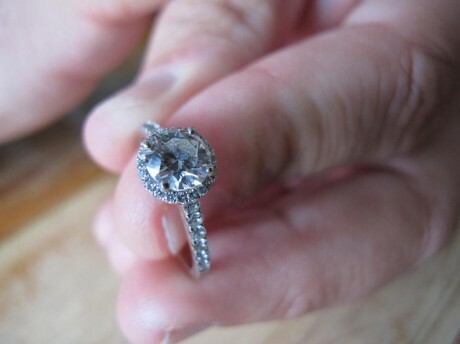 Size is also an important factor to consider when choosing an engagement ring. Yes, many girls dream of having a stone the size of a rock on their finger, but if that same digit is very slender, a boulder will look completely wrong. Whatever you choose, make sure that looking at your engagement ring will make you as happy for the rest of your life as you hope the person you are marrying will do.